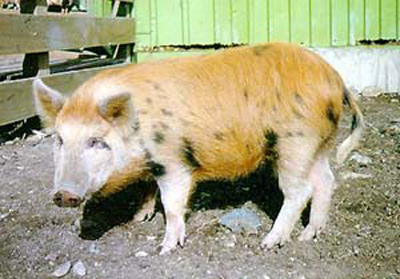 Several attempts were made over the years to catch some of the pigs, but until the late 1990s there were only a few adults on the mainland, and they were critically endangered on Arapawa Island itself. Then in 1998 four healthy piglets were recovered from the Island and these have been successfully bred from. Arapawa feral pigs are somewhat larger than those from the Auckland Islands with shorter noses and tails. Many are an attractive tan with black patches but other colours also occur, including pure black.